Creature Care Pet Resort is owned and operated by Melanie C. Garcia, a registered Veterinary Technician. At Creature Care your pet is our priority. 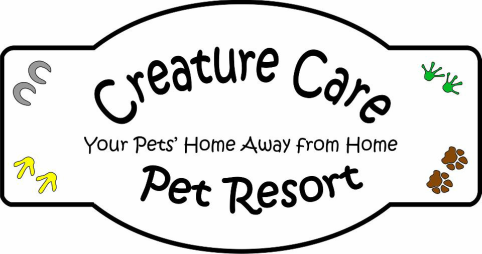 Creature Care Pet Resort is a modest sized facility with a caring staff. We believe your pets deserve individual care and attention. They are important to us and our goal is to provide them with a pleasant experience during their stay. Make your Boarding reservation today! We have roomy Country Suites for small to large dogs, as well as Gazebo Suites to keep small dogs comfy. Garden Condos are designed to give your cats a birds eye view. Ferrets, birds and other exotic pets are also welcome. Spa Services are available from our resident Groomer Ashley Dunlap. Dogs and Cats are both welcome, and we offer beak and nail trims for your feathered friends as well.